Here is a list of books on Claude Monet's life and art. Monet's Garden through the Seasons at Giverny, Vivian Russell, Rd. Frances Lincoln 1995 - 168 p.
An accurate description of the works of Giverny's gardeners illustrated by beautiful photographs. Monet's Passion, Ideas, Inspiration and Insights from the Painter's Garden, Elizabeth Murray, Ed. Pomegranate - 1989, 115 p.
Elizabeth Murray spent one year gardening in Giverny. In this book she shares her experience and teaches us how to create an impressionist garden in the third chapter "Bringing Giverny Home : Ideas from Monet's Garden". Monet's House : An Impressionist Interior, Heide Michels-Guy Bouchet-Helen Ivor, Ed. Clarkson Potter - 1997, 144 p.
A virtual room-by-room guided tour of the Monet's beautiful home at Giverny, a vivid impression of daily life in the beloved house where the artist lived for 40 years with his second wife and their eight children. Each room is explored in its own chapter with glorious color photos : the dining room, painted in two shades of yellow and adorned with Japanese prints; the blue-and-white-tiled kitchen; the blue drawing room; the studio as it appeared in its heyday. Enlarged paint swatches of Monet's unique color combinations accompany each chapter so that the readers can reproduce them in their own homes. The Taste of Giverny : At Home with Monet and the American Impressionists, Claire Joyes. Giverny everyday life by the time of Claude Monet and the American painters colony in Giverny. This book presents very nice pictures and paintings of Giverny houses and landscapes. It also gives some recipes extracted from "Monet's Table", an other book by Claire Joyces presented below. The last book of Daniel Wildenstein, The number One Expert of Claude Monet. Very nice photos of Claude Monet's garden and introductions by Daniel Wildenstein and Gérald Van der Kemp, the rebuilder of Monet's house. The Garden of Claude MONET The Four Seasons of Giverny Charles Prost, Ed. Casterman - 1993, 117 p.
Monet, late paintings of Giverny from the musée Marmottan, essays by Lynn Federle Orr, Paul Hayes Tucker, Elizabeth Murray Ed. Abrams - 1994, 88 p.
The catalogue of an exhibition from paintings of the Musée Marmottan throughout the USA. 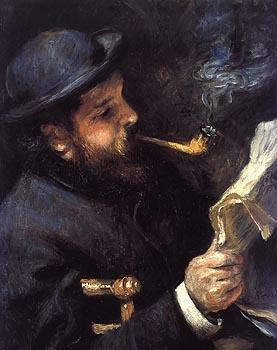 At the end of his life Monet suffered from cataract. His deteriorating eyesight led him to produce works celebrating color and forms at the expense of objective reality, anticipating later aspects of modernism. An art-book for children that tells the story of a young girl visiting Paris and Giverny. A Blue Butterfly - A story about Claude Monet, Bijou Le Tord, Ed. Delacorte Press Bantam Doubleday Dell Publishing Group - 1995, 32 p.
We fell inlove with this book ! Through short sensitive texts and delightful pictures Bijou le Tord manages to transmit a dreamy and accurate vision of Monet. An art-book understandable by small children that their parents will love too. THE REFERENCE ! Daniel Wildenstein is the official expert on Monet's works. This is the four volumes catalogue of ALL paintings, drawings, etc by Monet, including the most and the least well-known works. A unique opportunity to make wonderful discoveries and to understand the evolution and life-long search of the Master. A testimony of his exceptionally abundant production devoted to light and colours. A beautiful gift for all art lovers. Monet in the 20th Century, GeorgeT.M. Shackelford & MaryAnne Stevens, Ed. Paul Hayes Tucker - 1998, 280 p.
THE EXHIBITION CATALOG ! Color pictures of the nearly one hundred paintings of the 1998/99 Boston and London exhibition "Monet in the 20th Century", many close-up photos showing Monet's incredible brush work, and a very interesting introduction to Monet's art in the last quarter of his life. Monet's Table, Claire Joyes, Ed. Simon & Schuster - 1990, 191 p.
Monet was a gourmet and noted the recipes given by his friends painters and writers. Easy to try recipes which are an example of French bourgeoise cuisine at the beginning of the century.